EEEP the beetlejuice video ends with Jumpin the Line! Well, John and I are in agreement, because I am NOT liking the Beetlejuice dubstep either. The original piece is so gorgeous that dubstep ruins it. Being a die-hard Danny Elfman as a composer fan, this really kinda chaps my hide. Jen. There is a portal mod for minecraft. My husband and two little boys play it all the time. They punctuate portal/minecraft playing with playing the actual portal games. It's kinda trippy. I am not a maker at all and wish I was--I just have no skills in putting stuff together. I wish I could do makeup for films. I also used to be the prop master for a lot of plays when I was in high school. That being said, I am also fascinated by Adam's video. 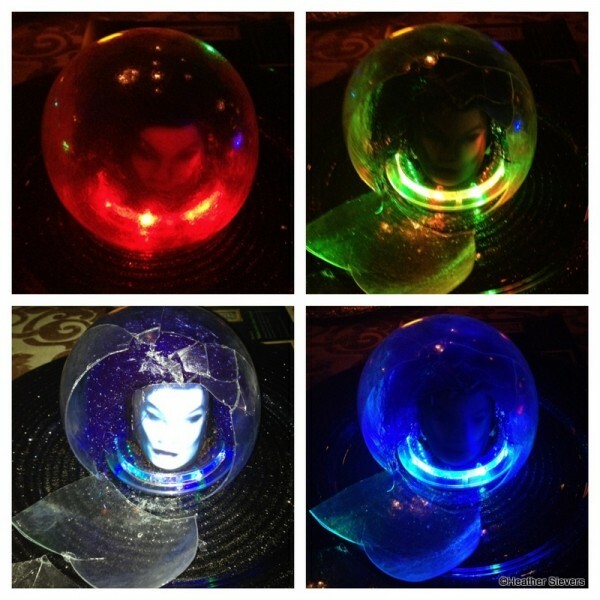 If I had a ton of money, I would be buying movie props like CRAZY. I am not all that good at video games, but I do want to get some games that I enjoy. Are there any that you might recommend? I did play Fable 2 for a while, but I got a little bored with it...and it was taken away :( In case you need to know, I have an Xbox 360, but no Kinect. Thanks! Ah, you're in luck! I did a post last year recommending 8 games for folks like me who either aren't great at video games or who don't like most of them. Here's the link. Hope that helps! My 13 yo son (who loves games but tries to stay away from the violent ones) picked up Mini Ninjas based on Jen's recommendation -- He's enjoyed it so far. 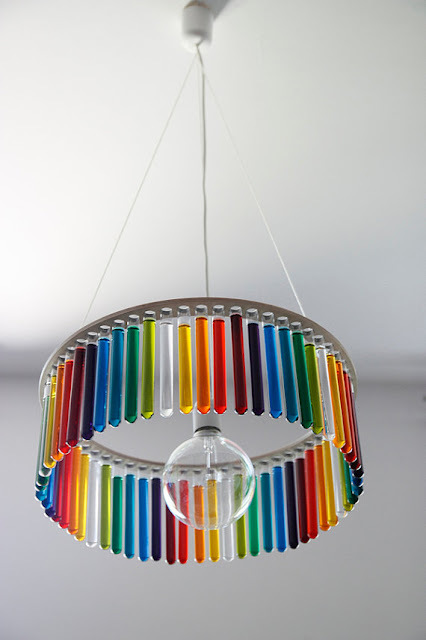 I love that test tube chandelier, only I would be afraid of somehow breaking that bad boy. It would be like being accosted by a rainbow. A glass rainbow. Sorry. It just looks so fragile. Learning how to make blown sugar like that has been on my bucket list for a while now! Especially for just that purpose, making desert globes with custard or mousse inside. Perhaps now I'll be re-inspired enough to try it out. 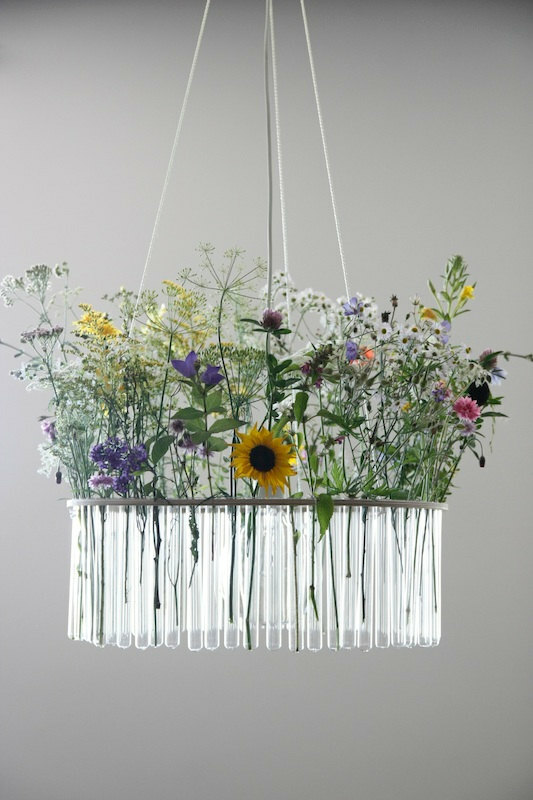 I HAVE to make a test tube chandelier! I'm thinking of using rubbing alcohol instead of water, as the water could end up growing algae, I would think. Now I just have to figure out how to make the ring to hold them! I've played plenty of video games but I haven't gotten into BioShock. However BioShock Infinite looks amazing and I really want to try it out. In your opinion can I start at that game or would I be missing things if I don't play the first two? Oh, no need to play the first two at all! Infinite has a completely new world with all new characters, so I'd say go for it! I love that the Bioshock cover art is reversible! What a thoughtful addition. I am "playing" Bioshock too, and literally last night commented on the hot dogs and sandwiches found on bodies too. It cracks me up. That Beetlejuice Minecraft video totally blew my mind! Obviously, they were using cheats to get unlimited materials, but even so, that's an insane amount of work and talent. I shudder to think how many hours went into this, but it was totally worth it. The piston work alone was beyond incredible. I am so excited to be the Art Giveaway winner! Thank you! I am looking forward to cherishing a piece of art selected and owned by the extraordinary Jen. This is so weird, I just found the Tested website today and had that video next in cue when I read your blog post. Then to add supreme weirdness, after seeing the props from Constantine, we turned on the TV and Constantine was on. Synchronicity! 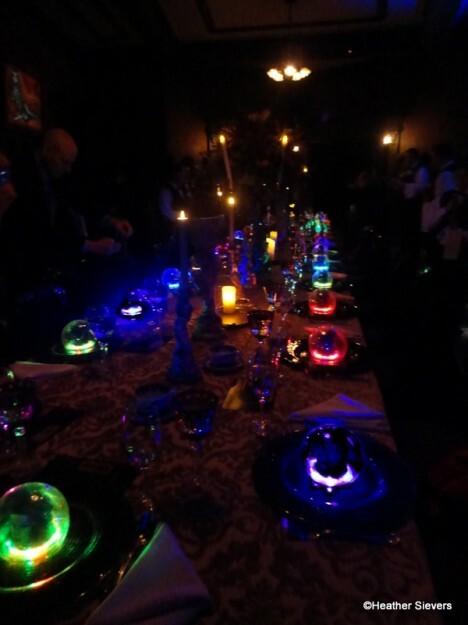 Thank you for sharing the Haunted Mansion dinner as well, I was a child of Disneyland (back when they still had A-E tickets) and the Haunted Mansion is my second favorite ride (just slightly behind Pirates of the Caribbean). Thank you for all you do. I don't comment very often but I always love your blog posts! That's how I "play" games with my husband too - we haven't had much time for that since we've had kids, (he still plays, I just don't make the time to watch) - but before kids we would spend several nights in a row with me watching him play. It was like a REALLY long movie!! 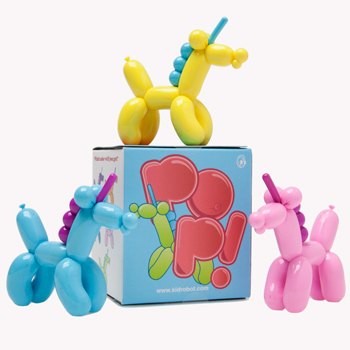 My son walked up behind me while I was reading this and yelled, "Balloon-a-corn!". I shared the Beetlejuice video with my Minecraft playing sons. They know how to build that kind of stuff, but haven't built anything that elaborate. I agree with someone above who said Minecraft makes them dizzy. I can't watch my kids play it. But, I like that they work together to create worlds on their server and they work with friends from school online. Minecraft is at least creative. It's like playing with legos. It's my favorite game that they play. Thanks for sharing the video! 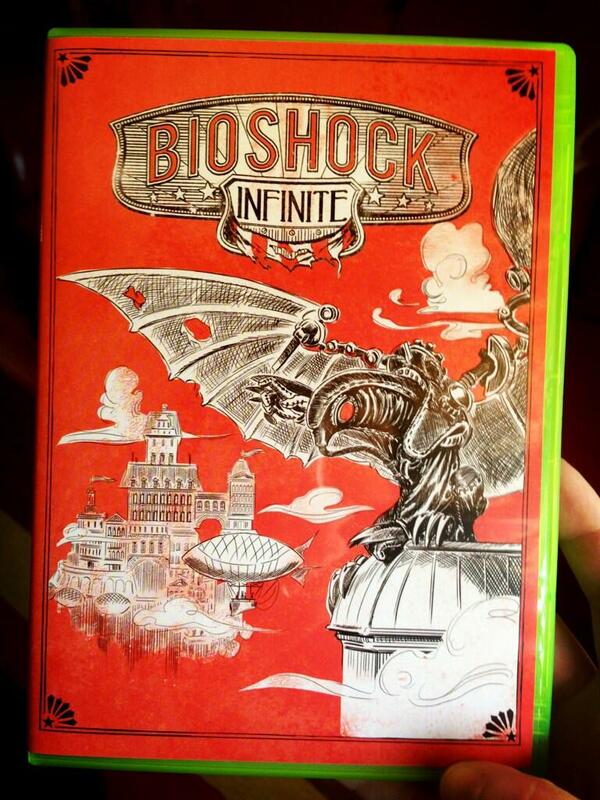 I can't wait to snag a copy of Bioshock: Infinite. I loved the first BioShock games, but I could only play them in small doses because they set me on edge. They were such creepy games, and I'm a sissy when it comes to scary stuff! Speaking of old posters, I recently discovered freevintageposters.com. There are posters for everything from Italian James Bond to syphillis testing, and all can be downloaded. I just gave my boyfriend this one for our anniversary: http://www.freevintageposters.com/2013/01/the-great-train-robbery-wrestling-for.html. I LOVED all of Adam Savage's awesome knick-knacks (I'm a HUGE sucker for tiny things, random do-dads and oddities). I'm going to find a way to get that Beetlejuice Dubstep on my iTunes (and possibly onto Grooveshark since it's not on there as of writing this) so I can listen to it ALL THE TIME! I absolutely LOVE that movie (pretty much any Halloween-themed movie for that matter) and anything wubby is my jam! That vid was amazingly trippy and mindblowingly awesome. I was bobbing my head and smiling all the way through! I thoroughly enjoyed it. Wait, YOU HAVEN'T PLAYED MINECRAFT YET?! Well, first of all, YOU MUST PLAY IT, and second of all, you can not truely appreciate contraptions like the Beetlejuice rollercoaster until you realize how hard it is to make ANYTHING with redstone in that game!